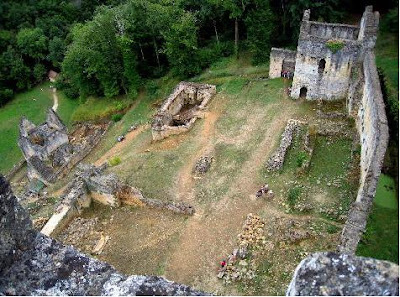 the Chateau Commarque, a French Castle ruin. She took the shot from the highest point, giving a great view of most of the grounds. The front shot is from the Chateau's Wikipedia page. 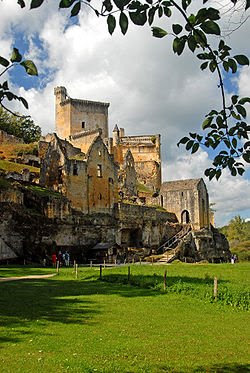 Founded circa 1100 Château de Commarque was just a protective tower establishe at a crossing of two important roads of French commerce: Périgueux to Cahors and Brive-la-Gaillarde to Bergerac. The Beynac family replaced the wood with a stone castle keep where they lived, and the fortification was enhanced. During the Hundred Years' War the Chateau was captured by the English who controlled the Chateau for many years. Undergoing restoration since 1994, Chateau de Commarque is listed as a historical monument by the French Ministry of Culture. Can't wait to see this castle! I want to visit France next year. I also want you to check this research paper introduction now. Don't forget to do that!